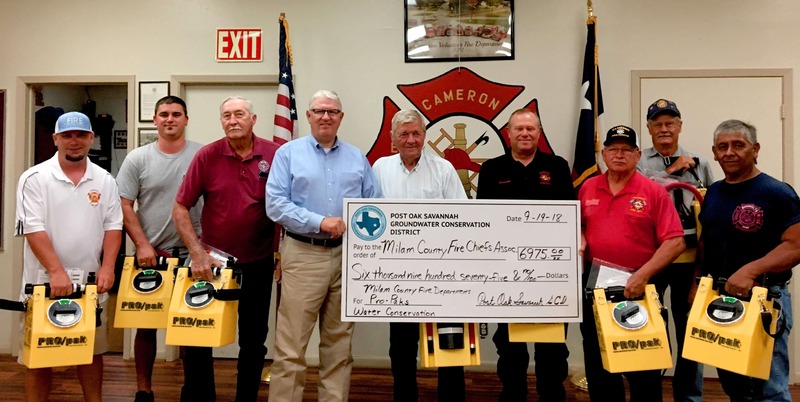 This past week the Post Oak Savannah GCD Board of Directors continued its support of local Fire Departments and efforts in water conservation in the District by providing a check for $6,975 to the Milam County Fire Chiefs Association for the purchase of nine new PRO/paks that use foam to suppress fires instead of water. This firefighting system is portable and self-contained to better combat both Class A (combustibles) and Class B (flammable liquids) fires. The refillable PRO/paks attach to the end of a fire hose to coat the fire in foam which deprives the fire of oxygen, thereby reducing heat. By suppressing combustion, the foam reduces the use of water by making the equivalent 15,000 gallons of water from only 250 gallons. Board of Directors President Sidney Youngblood shown above presenting check to the Milam County Fire Chiefs Association meeting in September. Listed from left to right, Michael Stewart (Rockdale VFD), Jared Melde (Thorndale VFD), Chief Jesse Love (Milano VFD), John Lawhon (Minerva VFD), Kenneth Zbikowski (Bartlett-Davilla FD), Chief Henry Horelica (Cameron VFD), Chief Gene Klein (Burlington VFD), Chief Robert Rodriguez (Buckholts VFD). Not pictured, Chief Wade Timmerman (Gause VFD). Post Oak Savannah Groundwater Conservation District is thankful for the service of our fire departments and proud to support safer, more environmentally friendly alternatives for fighting fires by these local heroes.